Electrical Circuits with Variable Parameters Including Pulsed-Control Systems focuses on the processes, methodologies, parameters, and approaches involved in the study of electrical circuits. The publication first offers information on the forced current component in an oscillatory circuit with a periodically varying inductance; free oscillations in circuits with variable parameters; and operational admittances and system functions of circuits with variable parameters. The text then examines the calculation of transients by the Fourier-series method and methods for the analysis of pulse circuits and problems of the theory of pulse and digital automatic controllers. Discussions focus on theoretical principles, frequency characteristics of impulse functions, determination of the value of the system response to an impulse disturbance at instants of time between impulses, and derivatives and integrals of impulse functions. The text ponders on the stability of circuits with variable parameters and the stability of periodic modes of operation in non-linear circuits, including the approximate method for investigating the stability of periodic modes of operation; remarks on the investigation of the stability of circuits with feedback containing parameters varying periodically (or exponentially); and analysis of the stability of pulse circuits with feedback. 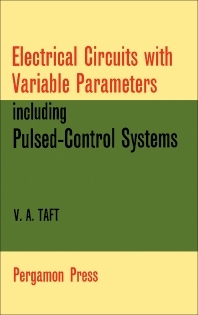 The publication is a dependable reference for readers and engineers interested in the study of electrical circuits.